The long path of step 18 consists of five subcycles. During the first three cycles the initiated leaves the - in comparison with the "red sea" of step 13 - small and clean and flat water - pond of subconsiousness behind. 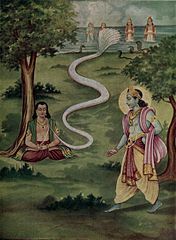 Then follows a long lunar cycle - comparable with Kurukshetra of the Mahabharata, and then he passes over the guardians of the threshold and unites with the Paramatma-purusha or the equivalent dharmakaya. He goes through the gate of initiation and attains the true enlightenment - Nirvana or Nirvikalpa samadhi.